He told me bluntly, “Your food is too sour and too brown.” He was obviously not pleased with the adobo dishes he had sampled. Despite its lack of popularity then, my love for Filipino food did not falter. I continued featuring humble manangs (older women) who made habhab (noodles), longaniza (sausage), patis(fish sauce) or bagoong (fish paste) on Lakbay TV, introducing foreign readers to our delicacies on international publications, even giving talks on Filipino cuisine in the National Museum of Singapore. One of the chefs I wrote about some fifteen years ago was Fernando Aracama. Instantly becoming friends, we frequently discussed how underrated our cuisine was internationally. 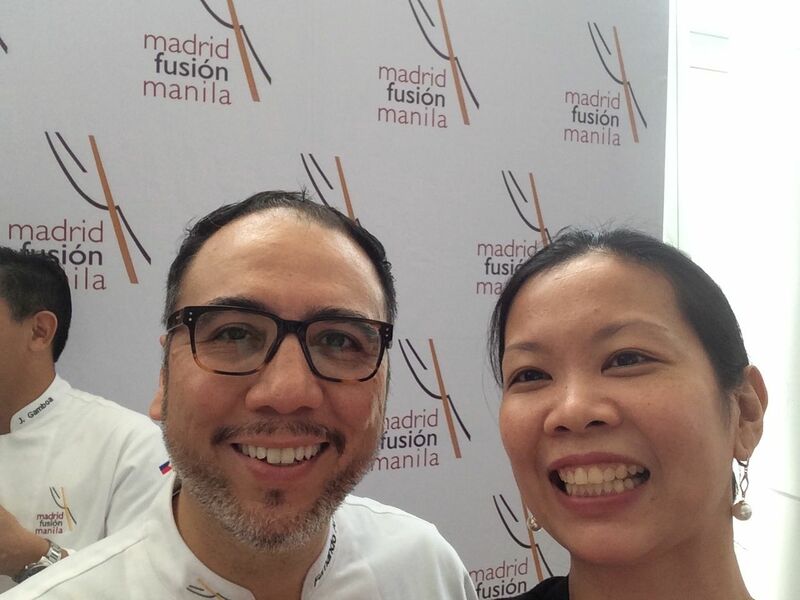 Fast forward to April 24, 2015, I headed to the SMX Convention Center for the first Madrid Fusion Manila (MFM). As I queued up to get my press badge, there I see Fern getting his presenter’s badge. 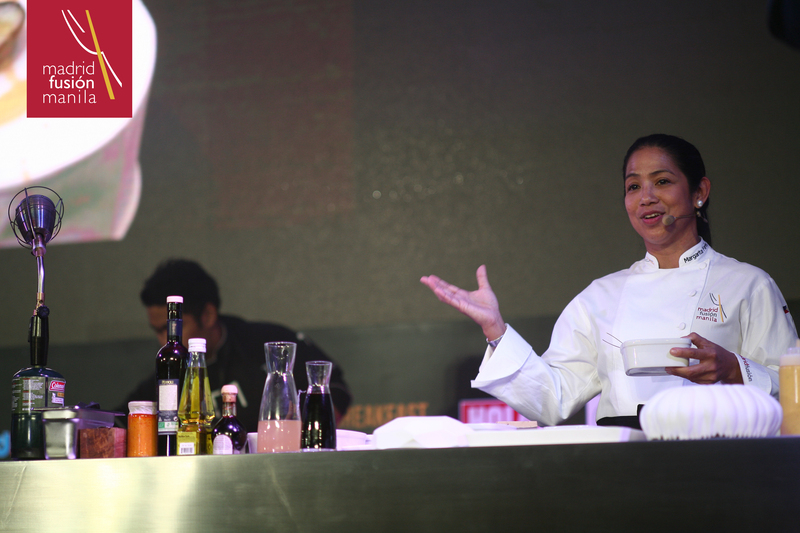 Aracama was one of the eight Filipinos who presented at the International Gastronomy Congress at MFM including: Margarita Fores, J. Gamboa, Chele Gonzales, Rob Pengson, Myrna Segismundo, Claude Tayag, Juan Carlos de Terry, Bruce Ricketts, and Pepe Lopez. 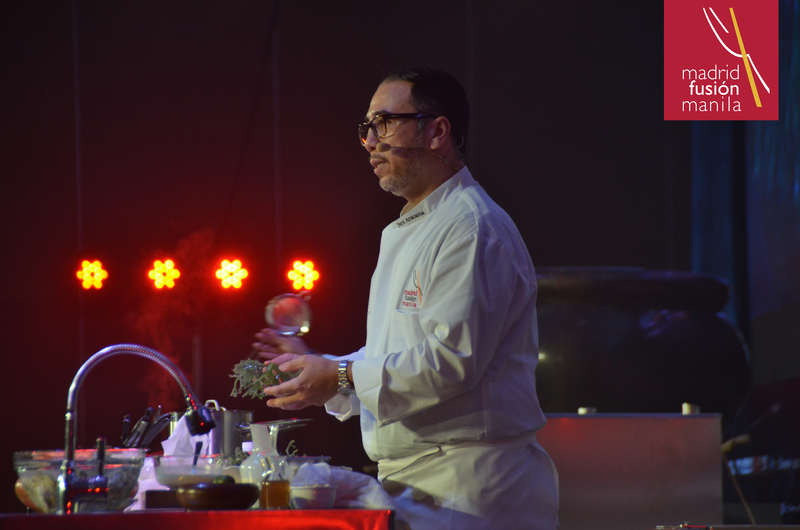 Spain was represented by an all-star culinary powerhouse cast of speakers with: Andoni Luis Aduriz, Elena Arzak, Quique Dacosta, Ramon Freixa, Francis Paniego, Paco Roncero, Mario Sandoval, and Paco Torreblanca. 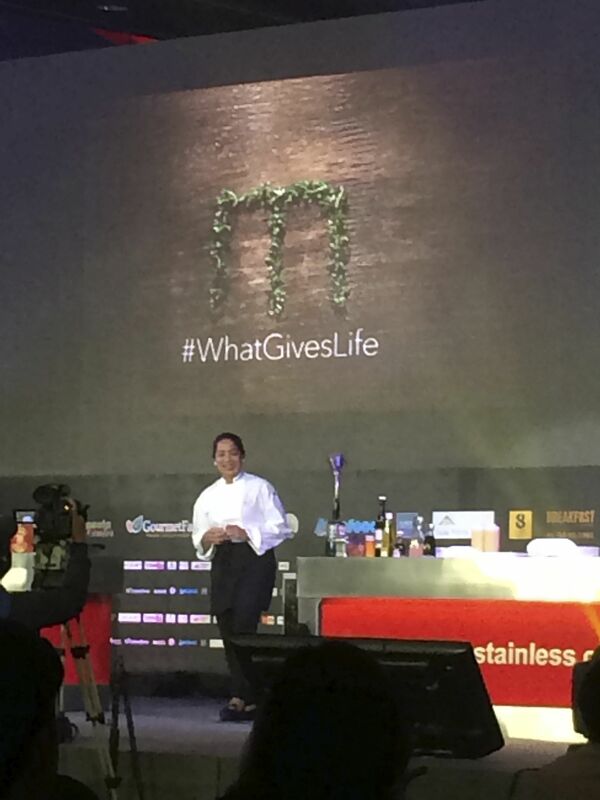 Two of Asia’s revolutionary chefs Andre Chiang and Alvin Leung were also on board as presenters. I had been to several big international congresses abroad, but this is the first food event of this magnitude for the Philippines. 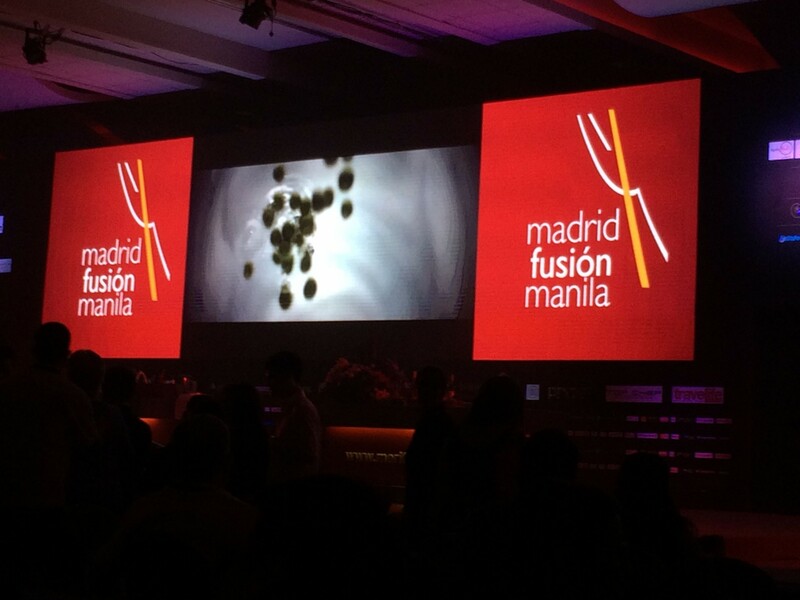 Entering the convention hall, the bold images of Filipino dishes took center stage on big screen with the Madrid Fusion logo in the middle. But what got me was when the Philippine national anthem played. Yes, indeed this was happening in my own country. 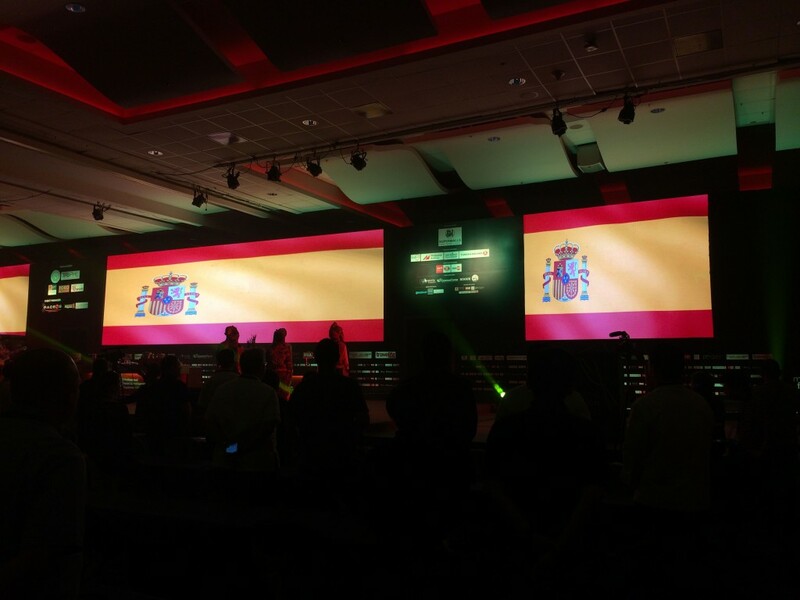 Then, the Spanish anthem played indicating the partnership of two cultures, two cuisines. When I saw my friend Fernando Aracama standing on stage, giving his presentation on Sour Fruits, I was thrilled. In our many discussions about Filipino food, I didn’t think this day would come- the time for Filipino food to be appreciated globally. Here he stood celebrating sourness, the most distinct profile of Filipino food. Growing up in Bacolod, the young Fernando often climbed his mother’s mango tree. Burong Manga (Pickled mango) was a staple in his home. His first taste of Kinilaw (Philippine Ceviche) is etched in his memory, when his father handed him a freshly caught crab claw dipped in coco vinegar. He educated the audience on Batuan, a souring agent used in Bacolod for Kansi, the Negrense version of Sinigang and in KBL (Kadios, Baboy & Langka), a hearty dish of pigeon peas, pork, and young jackfruit. He elevated the humble sinigang to a new level, souring it with Kamias and using Lobster. 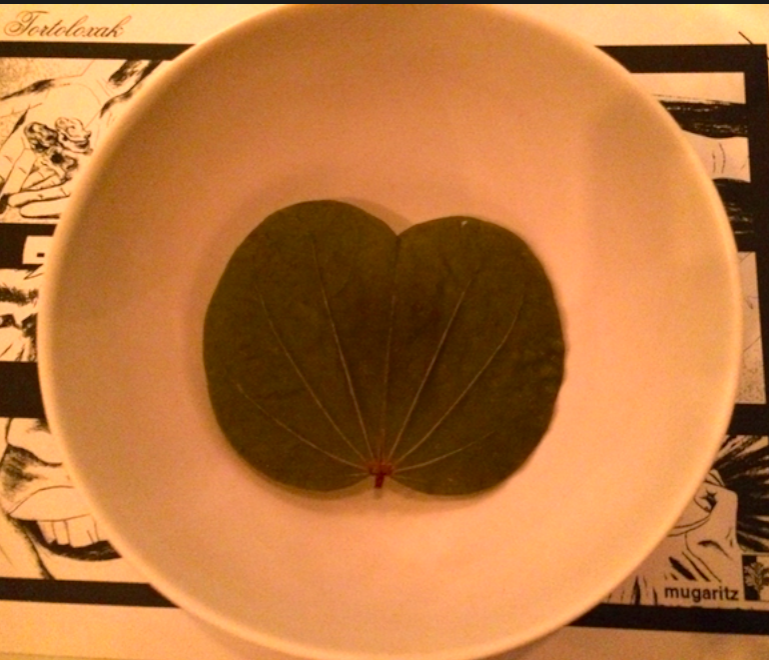 Weeks before when an excited Fern sent me a message from Japan, when inspiration struck him to create this very dish. At last, Asim or sourness was no longer too taboo. It was not too intense a flavor to put off world-class international chefs. In my one-on-one interview with Elena Arzak, she told me how she loves our sour ingredients like Coco Vinegar, Pajo (small tart mangoes), and calamansi. One surprising find Elena adored was Camachile (Pithecellobium dulce) a fruit I never really learned to enjoy eating. Arzak, the World’s Best Female Chef 2012 can’t wait to play with these ingredients back in her food laboratory in San Sebastian, Spain. Another spectacular presentation was Paco Roncero’s presentation on Olive Oil. Having experienced harvesting and pressing olive oil in Mendoza, Argentina in one of my travels, I was thinking this would be a lesson on the quality of olives oils. But to my surprise Roncero took my breath away early on Saturday morning. He created Paella, replacing rice grains with olive oil grains. The iconic Spanish Manchego cheese, he extracted the animal fat, and replaced it with healthier olive oil. Fores, a single mom gave a talk on “What Gives Life.” Her presentation focused on ingredients from reproductive parts of animals. Naturally, she spoke of the ubiquitous Balut, unfertilized duck embryo. But she also animatedly discussed decadent ingredients like Taba ng Talangka (Crab Roe), traveling to Alaminos, Pangasinan to meet Lilia Solis, a lady who has devoted her life to making the best crab fat paste Fores has ever tasted. While fish roe is not uncommon in many other cuisines, the sperm is rarely eaten. Bagaybay, or Tuna sperm is a delicacy, with the creaminess Fores likens to local Foie Gras. I have eaten bagaybay in Davao several times, simply grilled or panfried. 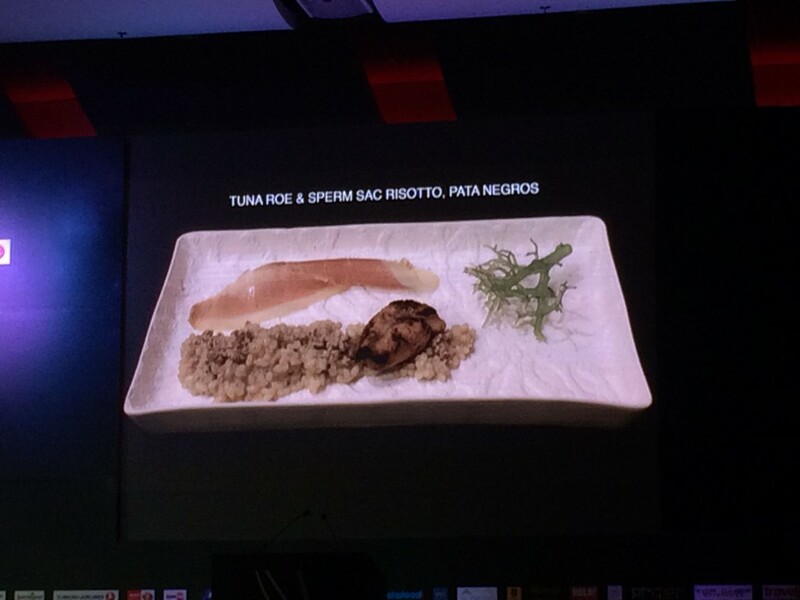 But trust Fores to posh it up in her Tuna Roe & Sperm Sac Risotto, Pata Negros. Smiling ear to ear, there, too was much sentimentality in Fores’ presentation. I could sense tears about to roll down her cheeks. Her classmates in Assumption were in full force at the front row supporting her (For this Assumption alumni, seeing her tight bond with her classmates got me emotional too). Plus her presentation was dedicated to her son, Amado. 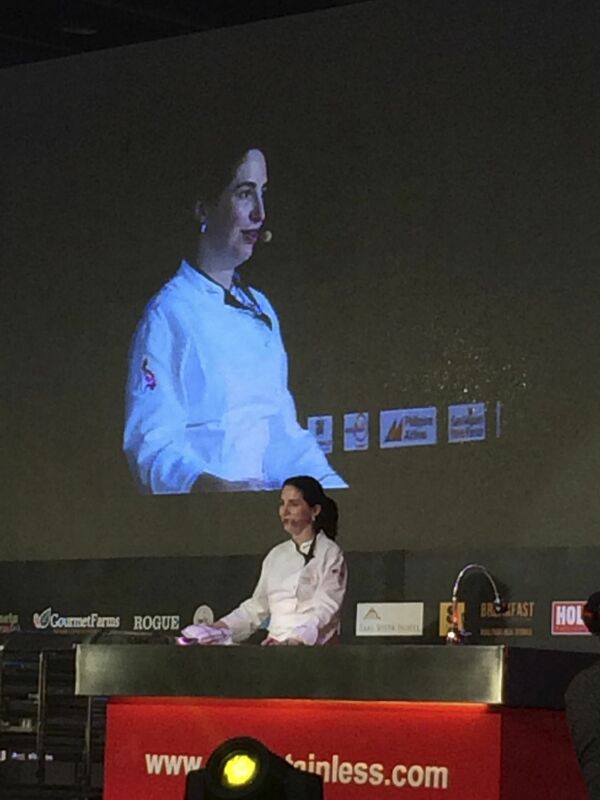 But maybe it was the immense feelings of seeing her dream, Madrid Fusion Manila become a reality. Another memorable presentation was from Chele Gonzales. 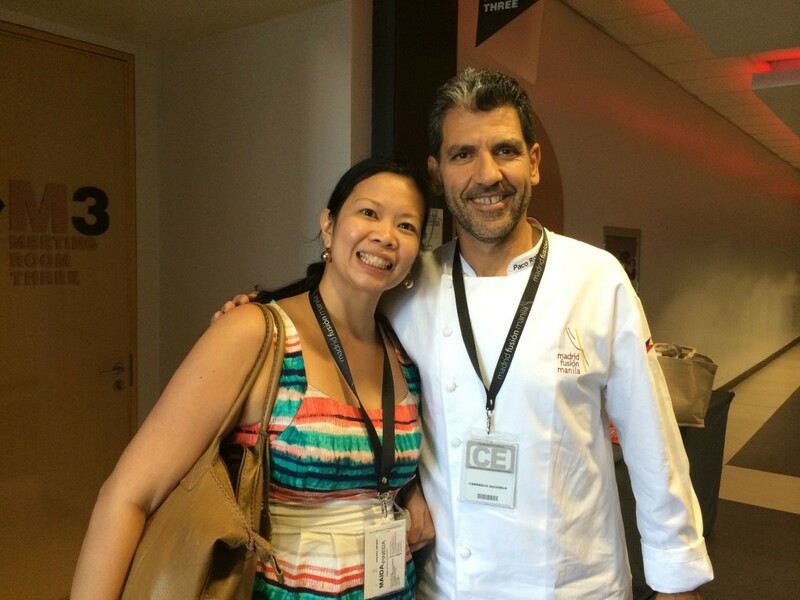 Gonzales is the Spanish chef behind Vask. Yes, he is Spanish, but his heart is Filipino true and true. Working for Sofitel Hotel. When Roxas Boulevard became one big sea, the waters flooded in the hotel forcing them to close for renovation. Gonzales shifted gears and opened Vask. Trained with the best in Spain, working alongside, Arzak and Aduriz, Gonzales was skilled in innovation. But a 14-day trip around the Philippines, from the islands to highlands, Gonzales found himself and immense inspiration for his cuisine. The result is a clever spin on iconic Filipino food. The humble isaw, grilled chicken or pork intestine, he elevated to his own shrimp isaw appetizer. He even discovered cooking with alibangbang leaves from his visit to Aeta tribes, an edible local leaf few Filipinos know about. The trade show next to the Congress was not to be missed. 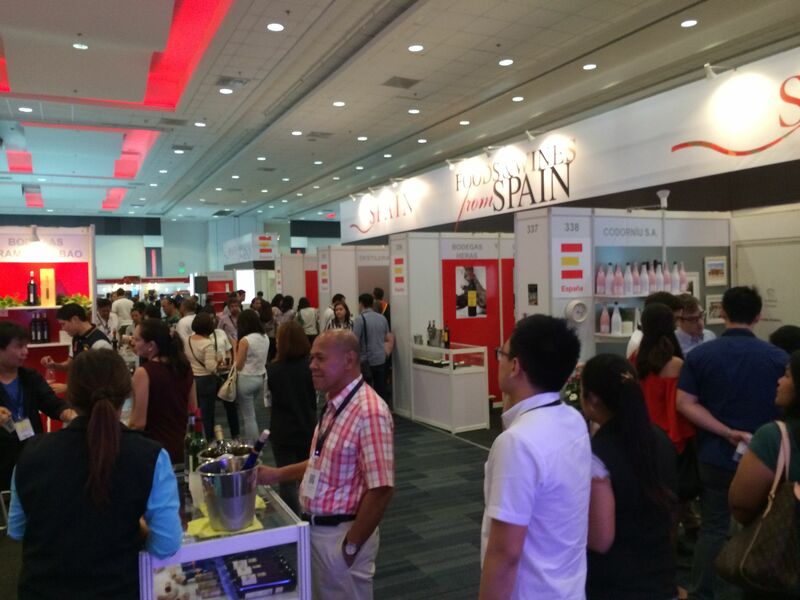 There were booths from Spain and the Philippines, as well as workshops throughout the 3-day event. 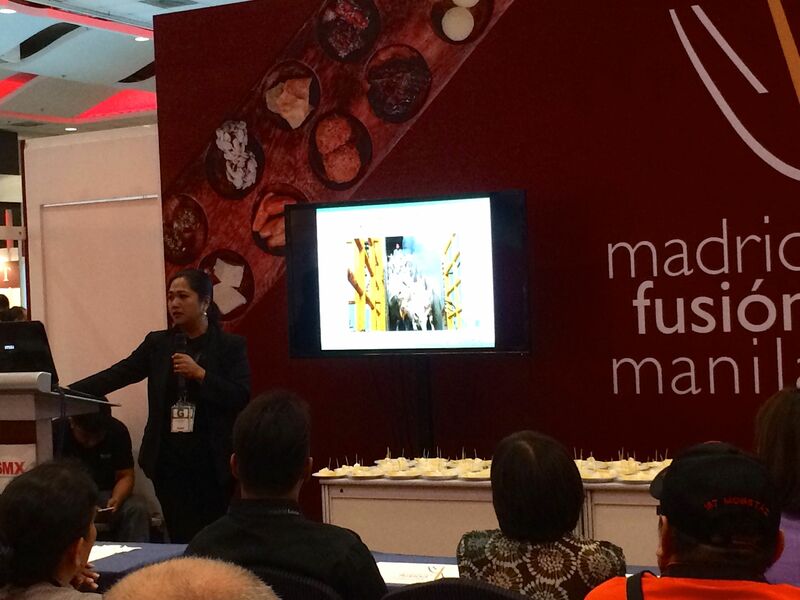 I was brimming with pride to hear Olive Puentestina, a Filipino cheese maker from Davao, give a presentation on her Malagos Cheeses. Puentespina has become a friend. Over wine and cheese, we have bonded. She fondly calls me “batgirl,” for I was writing an animal story on Davao the first time we met four years ago. Outside SMX, summer is in full swing. Reaching highs of 37 degrees, it is not ideal cheese-making conditions. An agriculturist, Puentespina knows that, but it didn’t stop her from making excellent cheeses. 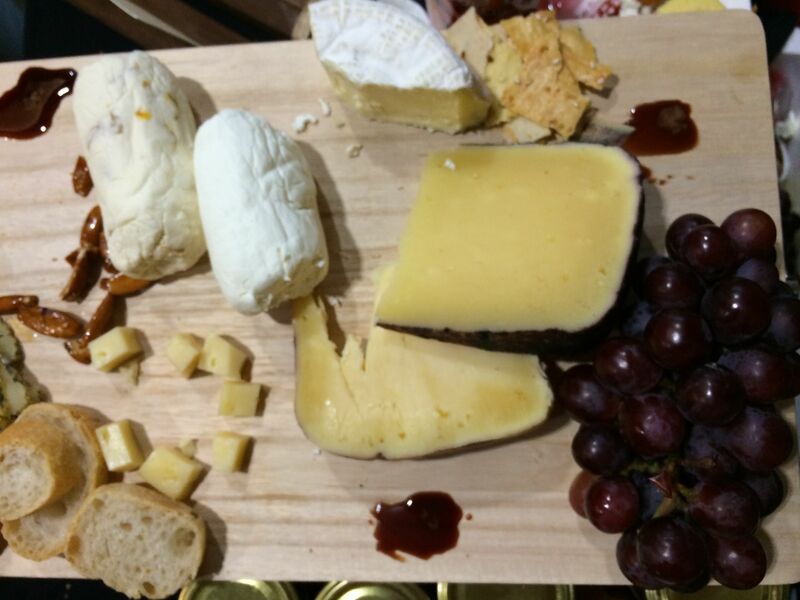 Malagos Cheeses: Made in the Philippines! 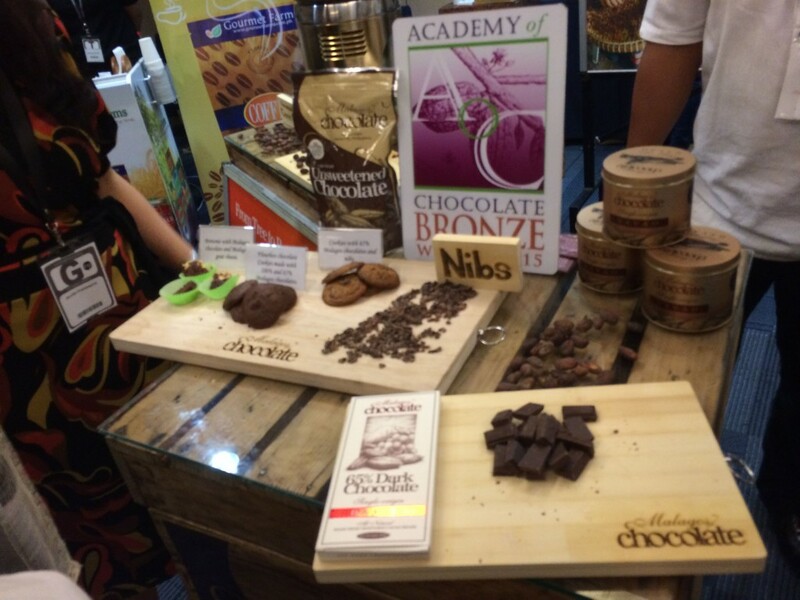 Her brother-in-law also put the Philippines back on the map as a producer of chocolates, with Malagos Chocolate winning Bronze Medal in the Academy of Chocolate Awards 2015 in the UK for its Malagos Premium 100% Unsweetened Chocolate for the Best Unflavored Drinking Chocolate category. 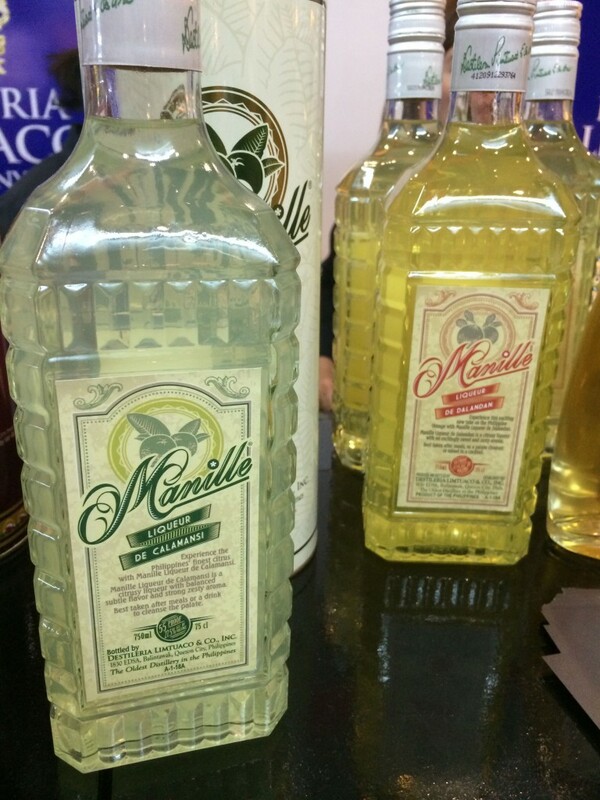 Interesting finds in the Trade Show include: Calamansi Liquor, think Italian Limoncello using local Philippine lemons by Destileria Limtuaco. They also make Dalandan Liquor and Cacao Liquor, similar to Patron’s Coffee Tequila but sweeter. But the biggest hit for me was the Department of Agriculture’s booth introducing the public to many local produce such as souring agents: Batuan, Tabon-tabon (tropical fruit used for Kinilaw from Mindanao) and Sua (Citrus fruit from Mindanao). 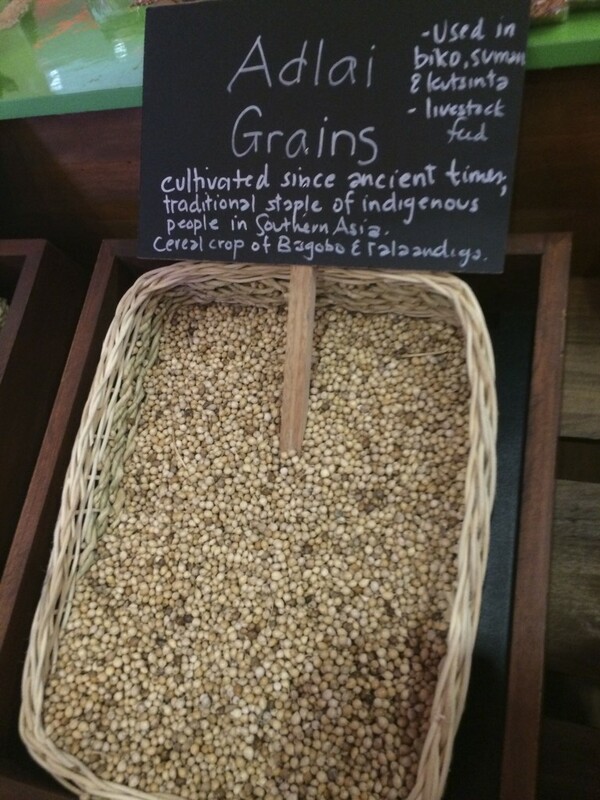 As ancient grains have swept the world from quinoa to spelt, I was thrilled to learn of Adlai, a cereal crop of the Bogobos and Talaandigs. I had to beg to buy their sample a kilo for P50, keen to experiment with this local grain. I will share my kitchen experiments with this grain soon. There were several four-hands dinners where one visiting chef paired up with a Filipino chef. But I was fortunate to Chele Gonzales opened Vask for a one-night only four-hands dinner with Elena Arzak and one-night only four-hands dinner with Andoni Luis Aduriz. I was fortunate to have been invited to the Aduriz-Gonzales dinner on the last night of Madrid Fusion (Post detailing this special dinner coming up soon). 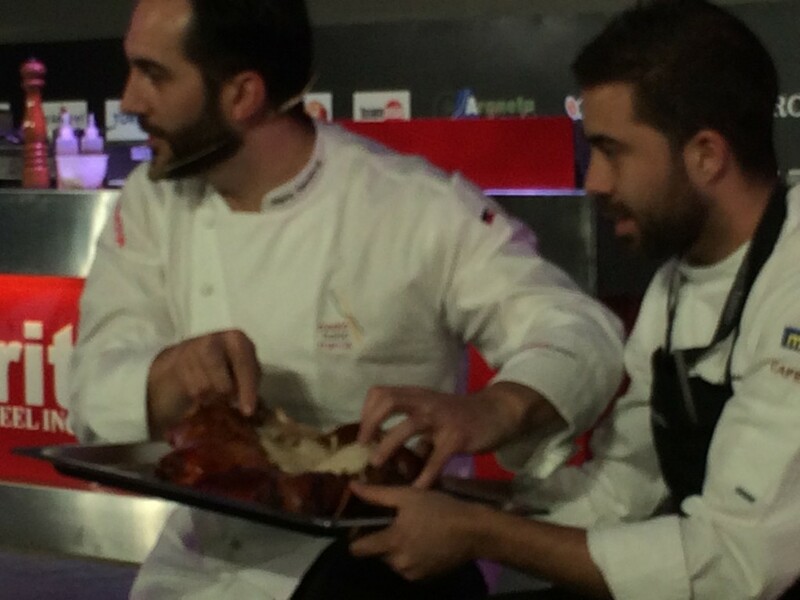 After interviewing Elena Arzak and Andoni Aduriz, plus the presentation of all eight chefs, it became clear: Spain’s gastronomy today way ahead in terms of innovation and creativity with the rest of the world. 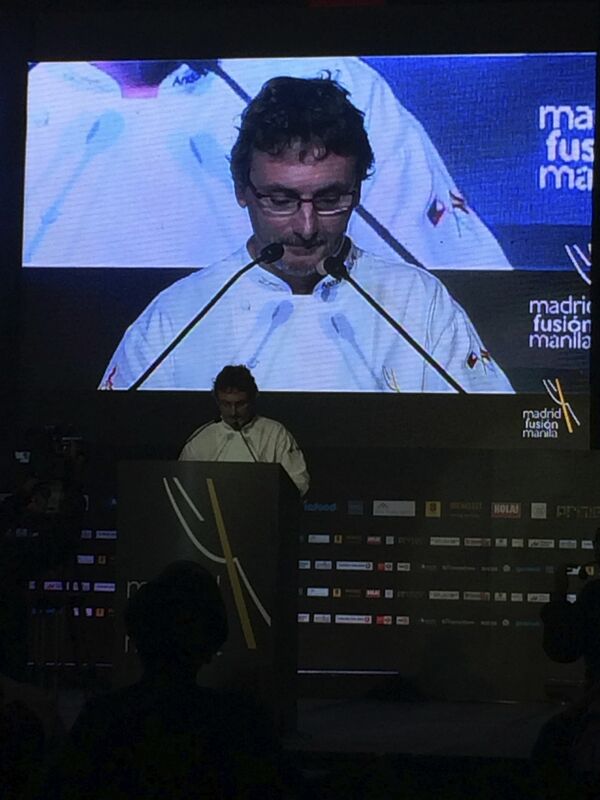 The eight Spanish chefs were inspired by their visit to Manila. They were impressed with not just the ingredients, but also the skill of the Filipinos. Seeing the fishmonger in Farmer’s Market skillfully debone the bangus for relyenong bangus, the chefs instantly wanted to bring him back to Spain with them. 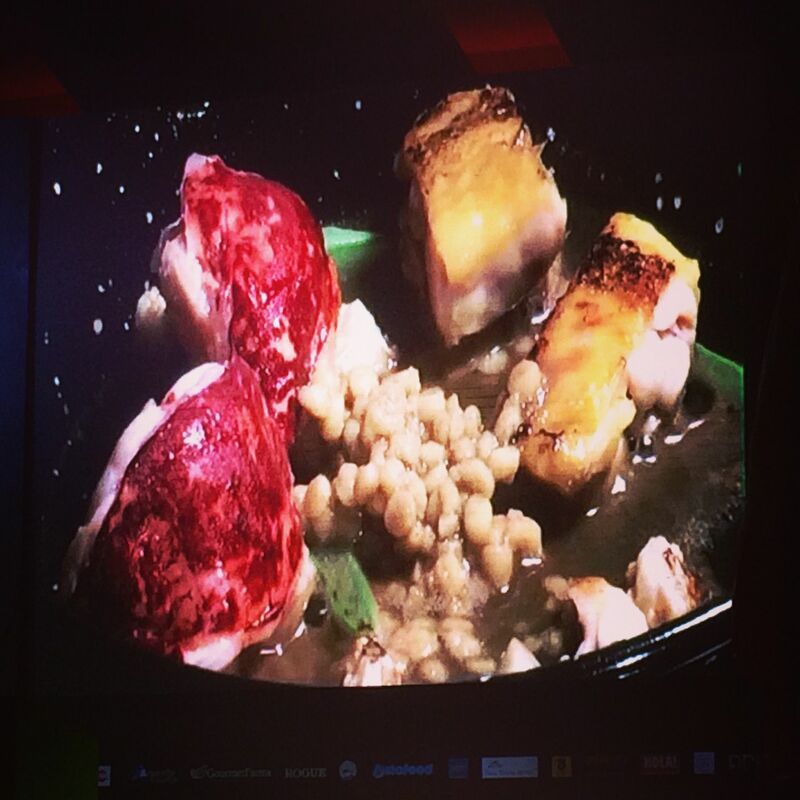 It took creative genius and openness of these Spanish chefs to fully appreciate the beauty in Philippine cuisine. 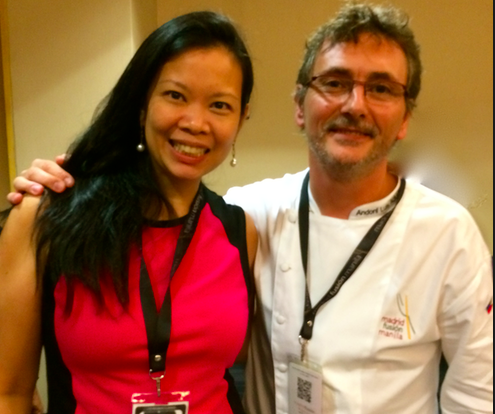 In my interview with Aduriz, I asked what him what he thought of the future of Philippine cuisine. With those wise words from Aduriz, fellow Filipinos, we’ve all got our work cut out for us. We have to work together. The time has come! Thanks Jen! I love both products and happy to promote these Philippine made food products.